Baran, you have done a very great job. Do not turn off the ability to use the old system of generation facilities. I advise you to develop graphical component of the project: the trees and the grass in the park, the generation roofs, the use of colors of buildings from OSM data, using height and initial position of buildings, separate textures for different types of roads (asphalt road, dirt road, path, etc. ) generation bridges etc. Kindly requested, will no longer spend as much sharp refactoring, this complicates the update is applied to the working project. You’re absolutely right about the refactoring thing, I hate breaking changes but I felt like I had to do it. I’ll avoid it as much as possible in the future. About visual stuff, I’m hoping to try BuildR some day, looks like a great script and would be a great addition to my project. I’ll look into other stuff as well but there is so much to do there and I feel like it’ll never be enough & look good. So it might be a better idea to keep visuals (models) abstract. Hi again Baran. Great work! During the initial load, all the tiles are being loaded all at once. Maybe it could be loaded one by one beginning from player’s current tile and then 8 outer tiles, then the other tiles. Also integrating weather from some API could be nice. Although that is a different scope, it could be a good mash-up. Do you plan to release this in Unity Asset Store after improvements and adding some options? It could be an Instant hit. Options could include colors, layers, tile size, number of tiles etc. Two questions 🙂 can you estimate how much data would OSM API would consume for an hour of walk in streets of Paris? Definitely less than Google’s static Image API :). Second question is on OSM’s capability. Do you thing it can compansate Google Maps ? I have seen that it is pretty detailed and better than Google for some parts of the largest cities. But in smaller towns it lacks Google Maps’ details. But still it has a nice coverage of roads. What do you think ? Yea it’s definitely possible to improve that loading part, especially the initial load. I’ll try threads and stuff there I guess, then maybe something like moving from center towards outer tiles etc. Weather is a totally different thing as you said. I’ll concentrate more on map at the moment but please let me know if you do that, would be great! I also want to release it on asset store, yea but there is soo much to do, I can hardly catch up with bug reports and all the feedback these days 🙂 Damn busy days. About data usage, it’s quite easy to calculate that. 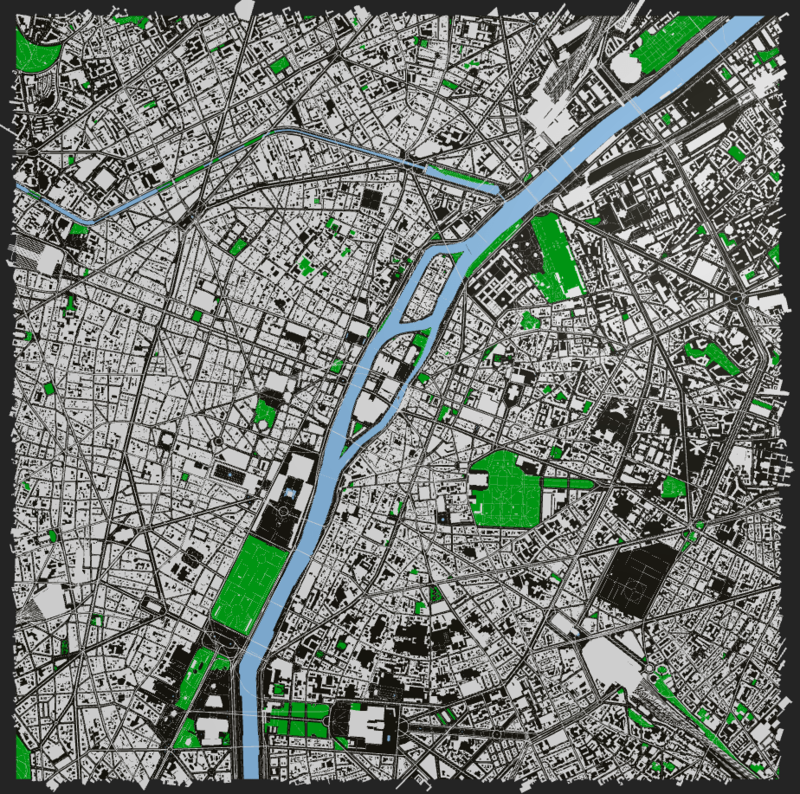 Paris for example is one of the best mapped places and each tile seems to take something like 250-300kb with four layers (building, water, road, landuse). Surely you can cache that and it’ll only go down in other, not so detailed, places. But I guess that’s enough for a quick estimate. It may not be less than simply pulling images (especially if they are low quality) but images doesn’t give you any data to work with so that’s a totally different thing. I have no experience with google data really, but if I’m not mistaken, it’s not free right? That alone pretty much kills it for me. I’m pretty sure it’s worlds better than osm, I mean osm doesn’t even have Istanbul mapped properly but…. it’s free 🙂 And yea, even though road data structure isn’t good, coverage seems great. Great work BRNKHY! Can we change the location to the United States? How do I enter a longitude latitude or address? .. the only google data that is free that I’m aware of is Google API, but does not include Building information, only mapping. Thanks! Hey Steven, glad you like it! You can find the lat/long settings under the “World” object. It should be ready to go after that! He seguido su trabajo desde su primera publicación y me parece magnifico, especialmente en su rendimiento, pensé que no seria posible visualizar tantas geometrías sin que cayeran los frames por el suelo. 1. Guardar o cargar los archivos .osm para poder visualizarlos de manera offline. 2. Un buscador para localizar calles, edificios o lugares, como lo hace google maps. Yo seria feliz con esas dos mejoras, pero solo véalo como una petición. Tal ves no lo conozca y podría ayudar un poco, es un proyecto similar al suyo y también es de código abierto. No hablo español, pero puedo usar el traductor de google! First of all, glad you like it! And yea I’m planning to start working on offline mode pretty soon (probably this week). I’ll do some very basic stuff at first, might extend that later on if necessary. Locating streets and stuff is also a very good idea. But it might not be that important for the majority so guess it’ll be low priority for now. Still I’ll definitely look into that! Thanks for your feedback man, means a lot! brnkhy..i like your great work….this version is better…….but i cant load tiles dinamic…….maybe i forgot something….or this version dont use it?………sorry for my bad english again……. Dynamic Loader is still there and should be working normally. Are you sure you have the DynamicTileLoader script on the World object, not the TileLoader? thanks brnkhy…..thats it……..its working now….i dont see both scripts in the same object……..maybe i need sleep more……….thaks again. It’ll be difficult to explain here like this but I’ll look into the gps thing soon. It’s holiday here next week so hopefully (and finally), I’ll have time for that! awesome man!!!! I’ll wait for that 😀 Thanks man! !